Join us Saturday morning, January 19th from 9:00–12:00 PM at the Tastee Diner, as we hope to draw an an extra-large breakfast crowd of Save the Diner supporters! It will be the last weekend before the pivotal Board of Appeals meeting that will decide whether or not Pure Hana Synergy can purchase the site and convert it to a medical marijuana dispensary. That hearing is tentatively set for Thursday, January 24th at 7 PM at the Laurel Municipal Center. In October 2013, the Laurel Police Department went pink for National Breast Cancer Awareness Month in an effort to raise awareness and support those with the disease. On a related note, the Laurel History Boys are excited to announce the formation of our team in the American Cancer Society’s Relay for Life—a tremendous event held in Laurel on Saturday, June 8th. You can help us raise proceeds for the American Cancer Society by making even a small donation. We’d also welcome you to join our team, or volunteer in any capacity. Can you help us? The “Donate” button below will take you to our team page. A Busy Week For the History Boys! We’ve had quite an eventful week! It started last Friday with an invitation to kick off Fox 5’s Zip Trip to Laurel. We filmed a quick segment bright and early at Towne Centre Laurel with Maureen Umeh, showing a few artifacts from Pete’s collection and explaining the interest in hyper-local history. We gave Maureen and the Fox 5 team t-shirts, and named them honorary Laurel History Boys! The following weekend, we hosted our first ever Laurel History Trivia Night at Oliver’s Old Towne Tavern. The event, originally scheduled for the previous Saturday, had been postponed a week when our beloved Washington Capitals were playing for their first Stanley Cup! We set up the game with six rounds of six questions each, followed by a bonus round. The questions got progressively harder as the game went on, and were worth more points. The turnout was fantastic, with a great mixture of teams that included the likes of former mayor Joe Robison and family, current mayor Craig Moe, and City Council Members Carl DeWalt, Mike Leszcz, and Eddie Ricks. There was also a contingent of longtime Laurel Volunteer Firefighters, as well as the Laurel High Class of 1972. The event was free, and prizes for the winning teams included Laurel History Boys t-shirts and stickers, vintage 1984 illustrated merchant maps of Laurel, and Laurel History Bucks—$12, $18, and $24 dollars off their teams’ tab, courtesy of Oliver’s! Pete displayed a number of items from his collection, including one that folks were encouraged to interact with—the original Laurel Police Department mugshot slate board from the C Street location in the 1970s–80s! We want to extend another huge thank you to Lenny Wohlfarth, Pamella Thompson, and everyone else at Oliver’s Old Towne Tavern for graciously hosting this event, and working so hard to ensure that everyone had a terrific time. UPDATE: Due to the Washington Capitals playing in the Stanley Cup Finals on June 2nd, (go Caps!!!) this event has been rescheduled for June 9th. The Laurel History Boys will be hosting our first-ever Laurel History Trivia Night at Oliver’s Old Towne Tavern on Saturday, June 9th! Think you know your hometown history? We’re talking about the people, places, and things—including the little details—that have defined Laurel over the past century. Put together a team of friends (maximum team size is six people) who know Laurel extremely well, and head to Oliver’s on June 2nd. First, second, and third place winners will receive Laurel History Bucks—good for up to $24 off your food/drink tab! Do your homework by studying your Lost Laurel book or blog, and reading Kevin Leonard‘s past “History Matters” columns. 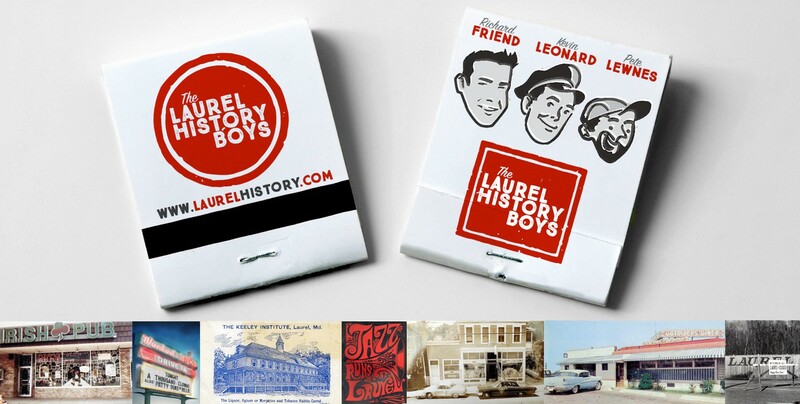 We’ll also have plenty of sample questions (and maybe even some clues) in the days leading up to the contest, so make sure you like and follow the Laurel History Boys on Facebook. This is a totally free event—just be sure to order something from the wonderful Oliver’s menu/bar and tip your waitstaff well!